Orion Ropeworks polyester rope is produced with 100% high tenacity multifilament fiber. Orion Ropeworks four-stage plied yarn construction insures a torque-balanced product; the firm strand comes in a medium lay construction insuring a durable rope with a long working life. 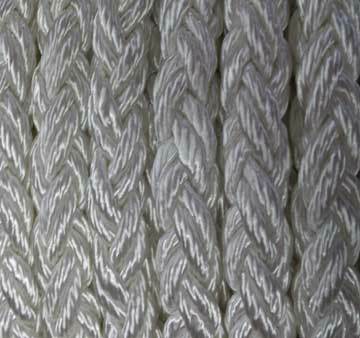 Highest grade of synthetic Polyester fiber yarns used in the cordage industry. This 100% Polyester fiber is perfectly balanced to produce a free running, hockle resistant rope with excellent wear ability. Regular lay (medium) construction means ease in splicing. This high strength heavy synthetic fiber is resistant to ultraviolet deterioration giving it greater weather resistance than either nylon or Manila fiber. Due to polyesters low water absorbency, only slight strength loss is experienced when wet. Polyester does not have the stretch and elasticity of nylon. Polyester is superior to nylon with respect to cycle loading and abrasion. Good for high friction uses like marine running, rigging and stringing line. ***Do no exceed working load limits.